I feel that a greetings is the appropriate way to begin an introduction about myself. Let's make it heartfelt as well. Hello and good day to all you people of a Dissimilar Nature! I recently caved in and created an account on the website after well over a year of playing on ADK servers across multiple games. 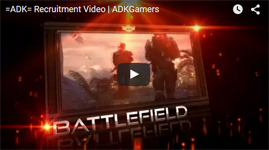 I first found ADK via Battlefield 3 and recognized it as a great server. I played my remaining days in Battlefield 3 (Remaining, for I was fated to forsake that game for greener pastures thereafter.) almost exclusively on ADK servers. I proceeded to join the Teamspeak server and played on the Minecraft server, DayZ, Battlefield 4, and played some games with other members in League of Legends. Now I am coming back after a long vacation and decided when I logged into one of my favorite games, Planetside 2, that I needed to find myself an outfit. Lo and behold I play New conglomerate since release, and I chose Connery because my friends who got me into the game pestered me into the west coast server because I had lower ping than them, even though I live on the east coast. And thus the intro to our intro is complete. I caved in and am now doing an introduction because I want to hang out with the cool people that I already know are in =ADK= while playing one of my favorite games (Planetside 2). I normally wouldn't touch any sort of forum with a 10 ft. pole. Truthfully forum posting just is not nearly as fun or personal as VoIP or even in-game chat for me and I have posted a total of 3 or 4 forum posts in my lifespan. I still peruse them on occasion though, mainly because I like being well-informed. You will find cool people around you will see. Maybe we will see you on DayZ or BF4 ! Welcome to ADK @[member='Haern'], Hope to see you in-game soon! I love TS too, more than forums, but any sort of VoiP is type of communication that is single time only, however forums are permanent (if the topic is not deleted) source of information that anyone can view, so I don't think there is any way to "remove" that requirement. However you can try to talk to anyone with Recruiter rank. Glad you decided to visit us and hope you will like it there! Awesome post, I am from Ohio and visit friends in Kentucky. What part are you from? Trust me the 20 post go quick and everyone is really nice and engaging. Look forward to seeing you on ts Haern. I live in Louisville, was born down in bowling green but we moved here for more academic and business opportunities. Cool avatar, did you draw that? You should find a strong and involved community here. Yeah this is one of my doodles, I have a few more "finished" pieces of art on my deviantart. Welcome to forums and ADK website!!! !.....Have fun is the key rule. The posts arent that bad and if you are in BF4, Titanfall, or ESO look me up. @[member='Haern'] Welcome and glad to have you here, If you ever wanna hop in dayz standalone or mod give me a shout. Welcome to ADK forums. I was the same way in my early years of PC gaming, i had 0 interest on joining any forums and was event hesitant to join this forum. Playing with the ADK guys on PlanetSide2 i decided to give this forum thing a try and now they cant get rid of me! A lot of interesting reads, opinions and upcoming games on these here forms. Always encourage newcomers to check out our Star Citizen section of the forum, also drop by the Rust section, both games have something that you will enjoy. C ya in the PlanetSide2 battlefield, ill be the gun running into a max! Welcome to ADK, My in game and steam name is Fiction. Feel free to send me a steam request for grouping up.